Now time for some exciting news! If you don't already know (you should, you should! 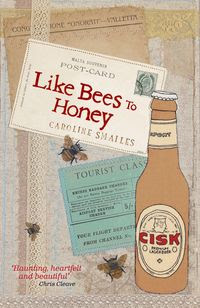 ), Caroline Smailes' new book, Like Bees To Honey, will be published next week. And I cannot wait to read it. I've been following Caroline's blog for ages now and Like Bees To Honey sounds like a really personal and emotional story. Set in Malta, which makes me really intrigued. Just look at that beautiful cover! And read the synopsis... doesn't that sound wonderful? A major new novel from the acclaimed author of In Search of Adam and Black Boxes. Nina, her son Christopher in tow, flies to Malta for one last visit with her aging parents. Her previous attempt to see them ended in tears. Disowned for falling pregnant while at university in England, she was not allowed into the house. This will be her final chance to make her peace with them. But Malta holds more secrets and surprises than Nina could possibly imagine. What she finds is not the land of her youth, a place full of memories and happiness. Instead she meets dead people. Lots of them. Malta, it transpires, is a transit lounge for recently deceased spirits and somehow Christopher enables her to see them, speak with them and help them. And, in return, they help Nina come to terms with her own loss. One so great that she has yet to admit it to herself. Like Bees to Honey is a story of family, redemption and ghosts. It is a magical tale that will live with you long after you finish reading. Today, I am thrilled to take part in her blog tour, where the entire book will be previewed for you all! Start from the beginning at Caroline's page here and when you're caught up, the chapter following mine will be found here! And enjoy! This does sound good! And, like you, I love that cover. It's so inviting!